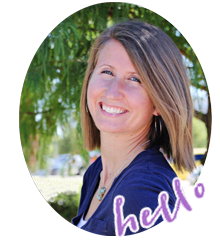 I've talked before on the blog about how much I love Minted. I order our Christmas cards from there every year because the quality is great, they do free address printing on the envelopes, and the designs are unique. 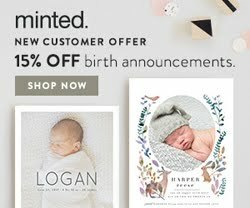 So I was super duper extremely excited when Minted asked me if I was interested in reviewing their art prints and hosting a giveaway on the blog. Um, yes thank you. 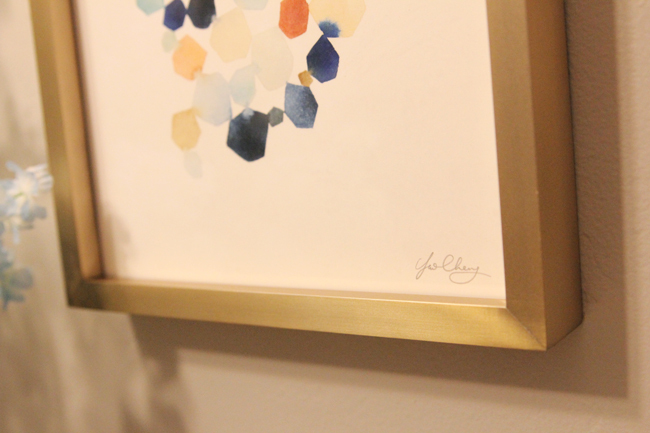 Scroll to the bottom of this post for your chance to win $150 to spend on Minted! 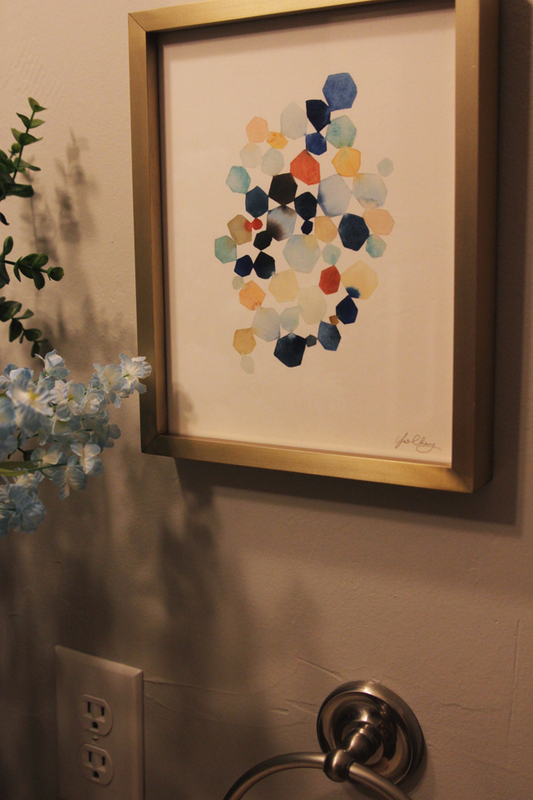 Minted has a ton of original art prints for every room in your house! They work with independent designers to bring you high-quality art and a lot of it is customizable, which is fun. Also (I feel like a game show host "Yes! There's more!") for an additional fee they will even frame your print! From wood to metal, they have a lot of color and style options for framing. I probably could have spent days searching for just the right print, but ain't nobody got time for that, so I basically skimmed through, chose the first two that caught my eye, and went for it. And I love them! First, a customized print for R's nursery. Obviously it spells out her full name, but I blocked it out to show on the blog. I wanted something that could go in her room now but also something that would work for when she's older. 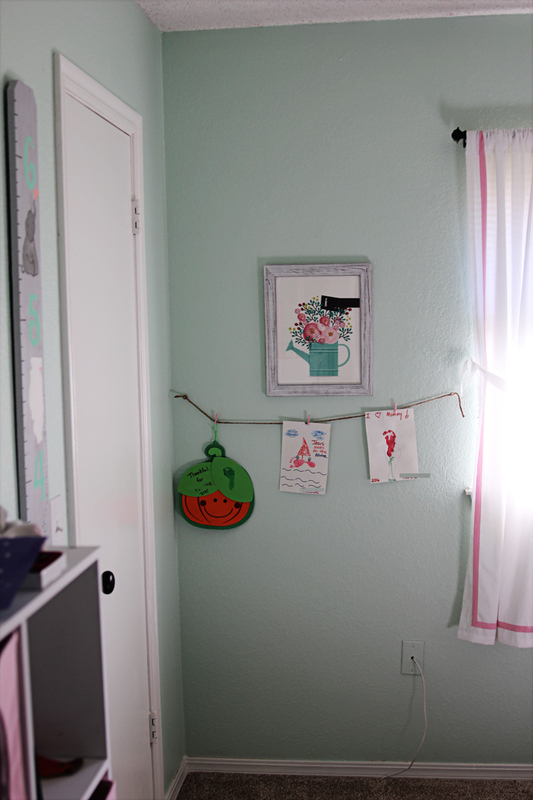 (See more pictures of her nursery here.) I went with a distressed white wood frame, and I was very happy to see it came with hooks on the back so it was ready to hang when I opened it. I hung it above the art R brings home from daycare. My child is so advanced writing her own name and drawing stick figures at her age. Second, a piece of abstract art. Jordan looked at me like I was a nut when I showed it to him, but for some reason I really liked the look of this simple print. I chose a gold metal frame, and I absolutely love it! I ended up hanging it in the guest bathroom, but I really could have hung it anywhere. What I think is fun about these is that you can choose to have the author's signature on the bottom. So cute, right? I did receive these prints for free in exchange for hosting this giveaway, but all opinions are my own. *Affiliate links are contained in this post. 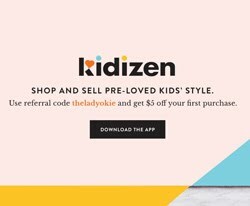 Minted is offering one reader $150 to spend on anything on their site! Giveaway ends one week from today, and the winner will be emailed. Note: This giveaway is only open to legal residents of the 50 United States and District of Columbia who are at least 18 years old as of the date of entry, except officers, directors, members, and employees of the Sponsor, the judging organization (if applicable), or any other party associated with the development or administration of this Promotion, and the immediate family (i.e., parents, children, siblings, spouse), and persons residing in the same household, as such individuals. This Promotion is void outside the 50 United States and the District of Columbia and where prohibited. I love Minted! We got our Christmas cards from there last year. They turned out to by my favorite Christmas cards we ever made. 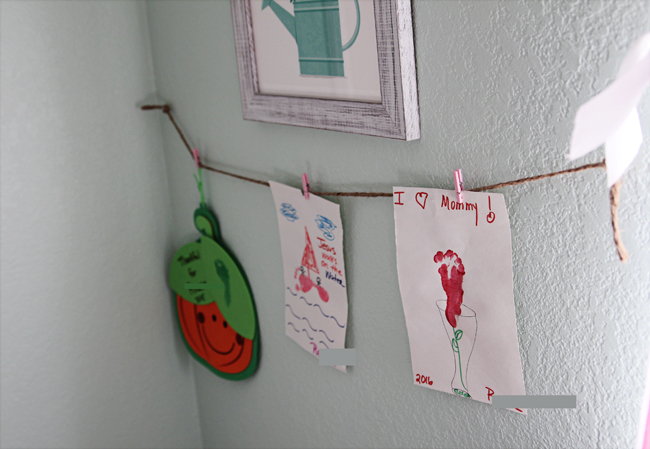 I adore that print in R's room and I love that you got that abstract print, something a bit different. that little flower bucket is SO CUTE! and i bet she will love it when she grows up too! :) a timeless piece! Those are lovely prints that fit your home perfectly! Thanks for hosting the giveaway! Your home looks so cozy and cute! 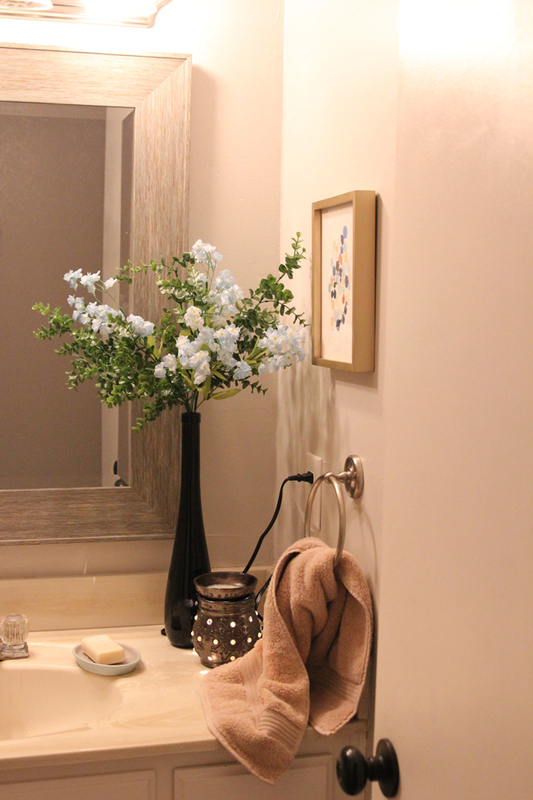 I don't put any effort into our guest bath and I really think I should. I'm a horrible host. I really like the two that you picked. I hope I win this giveaway. I saw that they came out with these little clothing labels that I want. I don't want to have to permanent marker all of Olivia's clothes. The little labels are so much nicer. 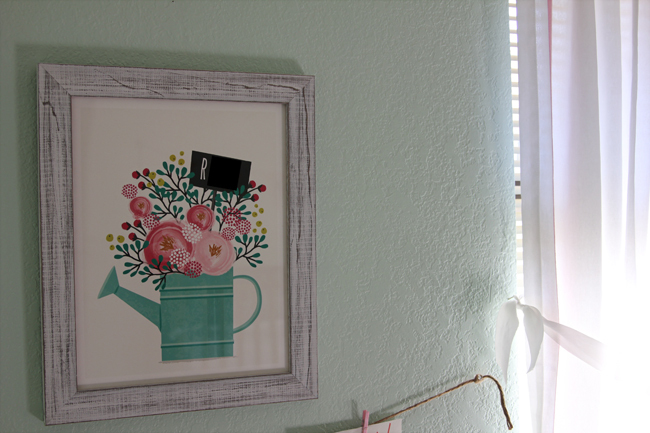 i have never ordered from minted, but i love looking at their stuff. one day! These are both so pretty! Great choices! How fun! I love all of your decorations you have gotten from them! That abstract print is really great! The one for R's room is super cute and I'm pretty sure those flowers in there are ranunculus, which are one of my favorites. I like the abstract art! Dave isn't a huge fan of that kind of art either but I think some of it is really pretty.